Successfully Added Parking Pilot - Parking Sensor + Special Breathalyzer Function to your Shopping Cart. 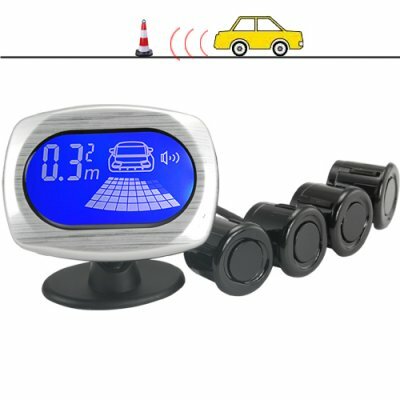 Real-time parking sensor kit for use with all makes and models of cars, vans, trucks and SUV's. Protect your valuable investment and make parking in tight locations safe and easy with the Parking Pilot. With the Parking Pilot you can accurately judge the distance between your car's rear bumper and any object that comes within a hazardous distance. This brilliant device uses ultrasonic technology to measure distances in real time and send an audible alert that increases in speed as you become closer to an object. The digital display even shows you the exact distance from an object so you can park your car with perfect precision every time! This is the ideal safety device for backing up, parallel parking, garage parking, and parking in tight areas where the risk of damaging your car is much higher. Did you have one too many at the bar? Then the Parking Pilot will alert you that it is not safe for you to drive, that’s right, the J18 (Parking Pilot) has a built in breathalyzer! By detecting the alcohol on your breath and warning you if you are unsafe to drive, you are not only protecting your car, but you are protecting your life and the life of others as well. Install this in your son or daughter’s car and feel relieved when they go out at night, or buy one for your friend or relative if they have a history of drinking and driving. You can put a price on your car, but you can’t put a price on a life, protect your loved ones and feel at ease with the Parking Pilot. Why risk damaging your car from unseen hazards when you can easily protect your valuable investment with the Parking Pilot? Order one today and relieve yourself of the stress and guess work of parking in tight areas, or order this product in bulk and make a great profit for your retail store or online business. The CVMX-J18 is in stock and ready for immediate shipment. This brilliant device is presented to you by the leaders in wholesale electronics, Chinavasion! The result of the breathalyzer are for reference only. We do not take any legal responsibility for the results given. Important Note: This product should only be installed by a professional. Carefully review the product manual before installing and using the CVMX-J18 to achieve the most satisfying user experience.